No brain tease here, just the fun of enjoying the licence plate and looking for a way to not reveal the State in which it is registered for the protection of the owner. 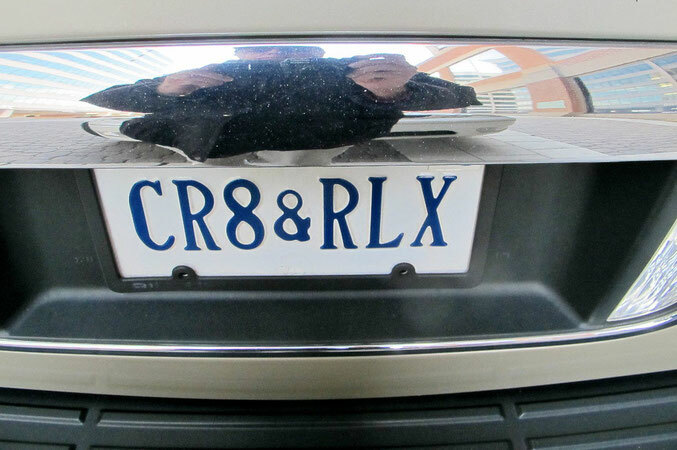 I first saw the plate on the front of the car, and realizing there was only an awkward way to crop out the State and leave the plate message somewhat centered in the photo, I stepped to the rear of the vehicle. There I found the overhead lighting fixture for the plate housed in a chromed piece. I did a slow move with the view finder and accomplised the mask off and had no realization that in the doing I was obtaining the inclusion of a carnival mirror like distorted self portrait. A sort of amusing double protection provied for the obscuring of the identity of both the owner of the vehicle and me, for my face. I hope you enjoy this image as much as I have. We are on the lookout for more, how, what, who, or even why, done for the future and hope to bring you another mind bender next week. I am having trouble understanding what this says. Anyone else able to tell what it says? Gabe you weren't the only one that had an issue understanding this plate. We believe the owner intended for it to be seen as Create and Relax, but who knows. What kind of car was it on, there is also a chevy csv-cr8 which he might be refering to. I guess while exploring alternate options to create and relax, RLX is a brand of clothing made by Ralph Lauren.